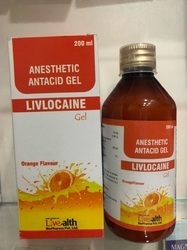 We are a leading Exporter of antacid powder and anesthetic antacid gel from Navi Mumbai, India. 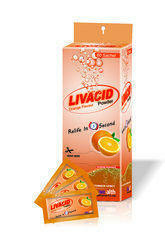 Livacid ( Antacid Powder ) is a Symptomatic relief of excess stomach acid, heartburn and dyspepsia. This medication is used to treat the symptoms of too much stomach acid such as stomach upset, heartburn, and acid indigestion. It is also used to relieve symptoms of extra gas such as belching, bloating, and feelings of pressure/discomfort in the stomach/gut. Simethicone helps break up gas bubbles in the gut. Aluminum and magnesium antacids work quickly to lower the acid in the stomach. Liquid antacids usually work faster/better than tablets or capsules.This medication works only on existing acid in the stomach. It does not prevent acid production. It may be used alone or with other medications that lower acid production (e.g., H2 blockers such as cimetidine/ranitidine and proton pump inhibitors such as omeprazole).If you are self-treating with this medication, carefully read the package instructions before you start using this product to be sure it is right for you. Some products have similar brand names but different active ingredients with different uses. Taking the wrong product could harm you. Ask your pharmacist if you have any questions about your product or its use. Packaging Details: 100 ml & 200 ml Amber pet bottles.